Have you noticed that dentists sometimes use words like maxilliary, atrophy, prosthetic – without realising that you (the patient) has no idea what they are proposing for you. Our approach is different – from the beginning we will try to make things easier by demystifying some of the common dental implant words and phrases for you. When a patient has a condition or circumstances which has caused the loss of all their teeth, or deterioriation of the teeth to an extent that the cracks, decay and chips are unable to be saved, then All On Four is the premium way to replace these teeth.A state of the art procedure to replace upper or lower teeth, with 4 dental implants, which can either support a denture (prosthesis) or ceramic teeth. In some cases there may actually need to be more than 4 implants, but its still known as All On Four concept. The clinical name for a filling. These days they are white (tooth coloured) with a choice of about a dozen different shades to ensure it matches your original tooth. In oder times Almalgam was used (silver fillings) but strategies to remove mercury from dentistry means this is really not carried out in modern dentistry in Australia any more. This is a fancy name for a filling. Its not as permanent as a ceramic restoration (crown or veneer). But often is used in a temporary period. This stage may be needed on some exsiting teeth during a transiaton phase. Bonding has a recognised shorter life span than ceramic (as the filling material may discolour or deteriorate with time). 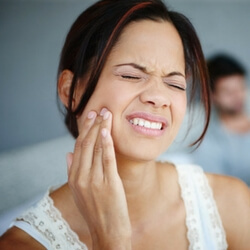 Also known as bone atrophy, when you lose a single tooth or multiple teeth (due to gum disease, extraction or an injury) the root is not there to stimulate the jaw bone – and bone mass & strength begin to wain, causing bone loss and the recession of the jaw bone. The longer after extraction this is left, the more difficult that dental implant procedures can be for some patients. Usually fixed permanently to adjoin teeth, to fill gaps of one or more missing teeth. Usually using full ceramic, or together ceramic solutions. Bridges can also be supported on dental implants (ie 3 teeth supported on 2 dental implants). Where a tooth is subject to fracture, cracking and potential loss, dentists will suggest to strengthen a tooth with a crown – which is a full ceramic, strong solution manufactured to fit your surrounding teeth. In some countries a crown is known as a ‘cap’. The crowns are made by a dental technician (or prosthesist – or ceramist) and are designed to match your adjoining and opposite teeth. Crowns are also placed on top of Dental Implants, and require specific connections to connect them to the titanium of the Dental Implant. A surgical procedure carried out often with a dental laser, that removes excess gum tissue to give a more even smile line, or the appearance of a larger or longer tooth. The tooth is not actually lengthened at all – but has the appearance of doing so. A type of xray that takes a measurement of the depth of your bone, which enables a dentist to make a decision about the likely success of a dental implant for your specific case. Without a CT Scan, a dentist will only be guessing about the nature of the bone. Only once the scan has been done would they be able to give you a full quote on your case. So if someone is quoting dental implants on the internet or in an advert, it will be a from price – and not necessarily the relevant price for your case. CT Scans referred by dentists no longer attract a Medicare rebate (this was removed from Dec 2014). Our partner radiographic Centre Collins Radiology (Collins St, Melbourne) charges $245 for our patients for this scan when you attend with a referral from us. For most CT Scans you will have 2 images taken – one of your jaw alone, and the second with a radiographic stent which is placed in the mouth, which assists the import of the image into the software we use to find the best location for your dental implant/s. We may be able to work with a CT Scan done elsewhere for the initial quotation, but usually we ask for a new one to be taken if we are going to undertake the surgery for you (as specific settings are required when the CT Scan is taken). A titanium screw which replaces the function of the roots of teeth that have been lost. There are many brands of dental implants (about 40 world wide – of which about 15 are approved for use in Australia). These Dental Implants support ceramic crowns, to replace missing teeth, and stop adjacent and opposite teeth from shifting, tilting or moving – and also to help with aesthetic solutions when missing teeth are visible. Dental Implants can also provide solutions for people with Dentures, who have trouble with them moving, flopping, or falling out. Falsies, plates, false teeth – they have many different names. Basically they will be constructed of acrylic resin, or metal frame, supporting acrylic teeth, to restore aesthetics and function where teeth are missing (from 1 single tooth, up to a full mouth of lost teeth). They are known as partial dentures when its for less than all teeth in one jaw, or full dentures when it replaces all teeth in the jaw. Metal framed dentures are also known as “chromes” or ‘chrome cobalt’ dentures. A thin, hard outer surface of the tooth that protects against decay – and gives the lustre and colour to the tooth. The formal name for removing a tooth from its socket in the supportive bone and tissue. Types of surgical procedures that have a view to replace bone deficiencies and give a better outcome for a dental implant. Gum grafting may attempt to rebuild gums where they have been lost, or where there are exposed teeth roots. Short for Mini Dental Implants, which is a brand of dental implants operated by the 3M corporation, ideal for stopping dentures from moving (ie stabilisation). They are not for single teeth. They have limited indications and are not suitable for all people. Originally a Swedish company who is recognised as a market innovator and the premium provider of dental implants. Their products including Nobel Procera, Nobel Replace, Tapered Groovy, Nobel Active and Branemark are at the cutting edge in the specific area of dental implants for each product. Their Nobel clinician software that we use is recognised as the premier software for choosing the ideal location for the dental implants, and being able to show this in a customer friendly way to the patient. A fancy name for any type of gum surgery. The clinical name for the bonding of the surrounding bone to the inserted dental implant. This can be tested using a number of test such as a sonic vibration test which we carry out at a review implant before moving to place a crown, bridge, bar or denture onto a dental implant. A serious form of gum disease that can lead to the loosening and loss of teeth. 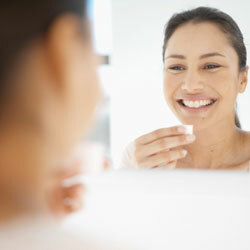 Caused by a build-up of bacteria from plaque, it can affect people of any age. The technical term for the part of dentistry where teeth-like structures are made, to fit into the patient mouth, to improve function and aesthetics. Prosthetics are things like crowns, bridges, dentures, implant, etc. A surgical procedure where the sinus floor is lifted away from the bone, to give more room for a dental implant to be placed. This is a complex surgery, which requires specific training – and very few general dentists have received this training. There re 2 major types of sinus lifting – vertical and lateral. Tested and true over many years, titanium and titanium alloys are proven to be a very safe and preferred material for dental implants as it seems to integrate well with the bodys living organisms. Dental images taken with a radiographic source, that can be captured on film – but more recently in digital format – so that dentists and dental specialists can inspect the underlying tissue structure and nerve locations. Dentists should be taking a number of xrays prior to any quoting on dental implants – as they need this information in order to find out what option is best for you. We typically will need an initial OPG (Panoramic) Xray which can be bulk billed to Medicare for you (at a clinic adjacent to us), and then a CT Scan (see separate heading on CT Scans). So hopefully that has shed a little light on some of the terms you have heard from other dentists – or seen online – and rest assured if you have lost a tooth or several teeth, or have concerns about the gaps in your teeth, that the team at Hampstead Dental talk in these simple terms – and will pause to answer any questions for you. The only dumb question is one you do not ask. Call us or use the contact form to make a consultation to find out how we can assist you with your dental needs.